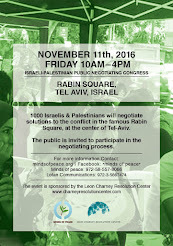 The next Israeli-Palestinian public negotiating congress is scheduled for April 10-11 at Almog Junction (which is on the road to Jericho, West Bank). It is the 25th such meeting, and each delegation will include at least 10 representatives from all walks of life -- Israeli generals, Palestinian commanders, Israeli settlers, Palestinian ex-prisoners, academics, business people, and students. With the goal of a larger congress always in mind, Dr. Sapir Handelman and Mr. Ibrahim Enbawi will once again demonstrate the real possibility of finding common ground among panelists reflecting the entire political spectrum. A larger congress, they propose, would help MOP show that solutions are possible.